Do They Have American Pit Bull Terriers at the Westminster Dog Show? The American pit bull terrier is not shown at the Westminster Kennel Club Dog Show because the breed is not recognized by the American Kennel Club. Westminster is an AKC dog show, and only AKC dogs are represented. The AKC recognizes the American pit bull's close cousin and lookalike, the American Staffordshire terrier, which is shown at Westminster. Both these breeds are easy to confuse with another, very similar breed, the Staffordshire bull terrier. The American pit bull is similar to the American Staffordshire terrier. The American pit bull terrier is recognized as a breed by the American Dog Breeders Association and the United Kennel Club. The American Staffordshire terrier is recognized by the AKC. If you watch the Westminster Dog Show, you will think you are seeing an American pit bull terrier, because the pit bull and the Am Staff look almost exactly alike. In fact, they are so close that some Am Staffs have been registered with the UKC as pit bulls, and some pit bulls with the AKC as Am Staffs. The American pit bull, the American Staffordshire terrier and the Staffordshire bull terrier were essentially the same breed until the 1930s, when the three types were developed and bred to be slightly different sizes for various uses. The differences in the three breeds are so subtle that even DNA tests frequently do not reflect a single one, but rather a combination of the three. So if you're looking at a Staffie or Am Staff in Westminster, it would be easy to mistake it for an American pit bull terrier. The American Staffordshire terrier and the American pit bull are closely related. American pit bull terriers are the result of breeding bulldogs with terriers when the breed was developed in England, Ireland and Scotland in the 19th century. Early breeders were looking for a dog who embodied the terrier's sense of game with the bulldog's athleticism. The first American pit bull was owned by the founder of the UKC, C.Z. Bennett, and registered in 1898. Since then, pit bulls have been owned by Presidents Theodore Roosevelt and Woodrow Wilson, Gen. George Patton, Fred Astaire and Humphrey Bogart. American Staffordshire terriers were first recognized by the AKC in 1936 and eligible to show at Westminster. Considered the Super Bowl of dog shows, the Westminster Kennel Club show attracts the champions in roughly 175 breeds each year. 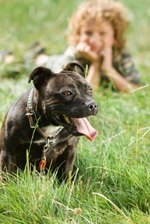 American pit bull terriers and American Staffordshire terriers have become known as distinctly separate since the 1900s, although the dogs remain strikingly similar in type and temperament. Without AKC breed recognition, the American pit bull terrier is not eligible for the Westminster show ring.